LOCATION LOCATION LOCATION Welcome to 161 Crocus St, located on the corner of Crocus St and Wasagaming Drive, 1 block from the Wasagaming Townsite, Marina, and Main Beach. The well-maintained cottage boasts 1031 sqft with a 456sqft deck, a spacious 210sqft shed housing laundry that could easily be converted to extra living space. 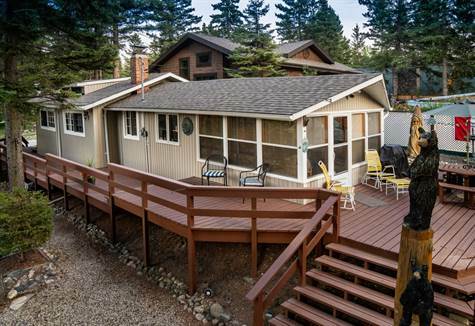 With 4 bedrooms and an ample sunroom, this cottage is set up with family in mind. Set high on the hill with a lake view, the low maintenance yard is beautifully landscaped with 2 accesses for parking and to ensure privacy. With a 42 year Perpetual Lease in place until 2060, you and your loved ones can experience Riding Mountain National Park for many years to come. Call today for further details.